Humans have been creating their own universes since we first painted upon a cave wall the reflections of the world as we saw it. Now eons later, on this solitary world, a blue ball of water in a vast ocean of darkness, there are countless worlds created and shared by us all. The worlds we can now explore seem to be as endless as our own imaginations. The past is also a world of its own. We can piece together enough to try to and explore it and learn from it. But the most tantalizing of the worlds we can attempt to explore is the future. 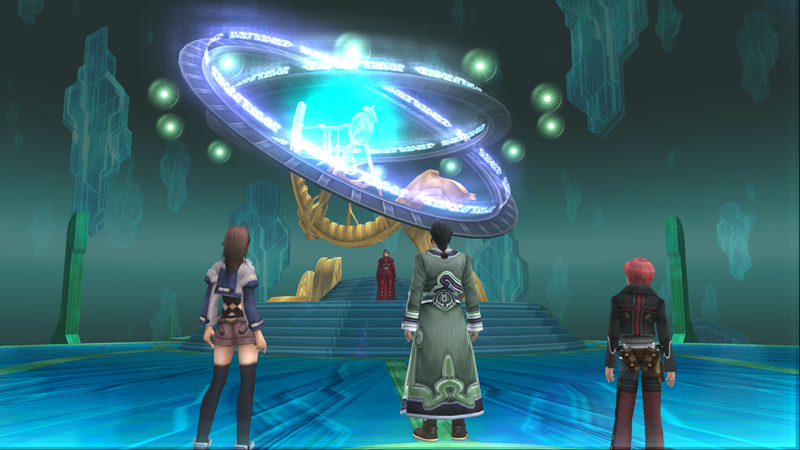 Through prophecy, the ancients attempted to explore this elusive world. 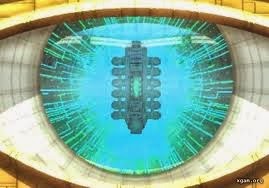 Yet prophecy has never been able to actually predict or create the future, at best, only attempt in vain to destroy it. Through exploring the world of the past, we see that dire predictions of the world's destruction are the most common prophecies. These prophecies never came true. The world changed and became new but did not cease to be. Through creation, the future is built, and through imagination we can create. We truly do not know what the future holds, but that means we can imagine the possibilities. It can be an overwhelming freedom that frightens some into staying within the boundaries of what we already know, but even if we never leave our world, one day our children will. They will leave the world we know and venture to worlds unimaginable by us. Indeed, somehow on one particular of this myriad of imagined worlds I even managed to find the woman I love and we managed to create a new world as well as a new life together. There is a sadness when we leave a world behind to journey somewhere new. A part of ourselves will always remain there and no matter where we go or what we do we will never be able to get it back. As you keep exploring you will surely find joy again... and probably sadness again too, but that's how the journey goes as you walk toward the future. As I bring my daughter into what I now realize is a boundless world, I cannot help but want to embrace a future where she can stand upon my shoulders and see farther than I could possibly imagine and imagine farther than I could ever dream. And I will pass down the controller to her so she might visit those worlds that once inspired me and take with her to the future to explore whatever worlds lie beyond. When I delve down the rabbit hole of philosophy, there are a few games I always think about. 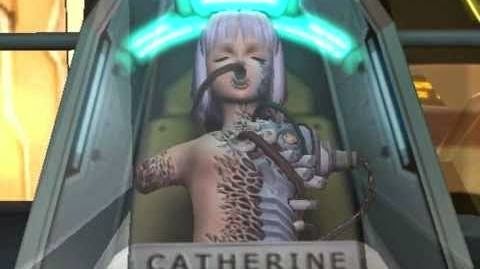 These 'Xeno' games share many of the same developers, who are well known for creating science fiction stories laced with heavy influences from western judo-christian religion. 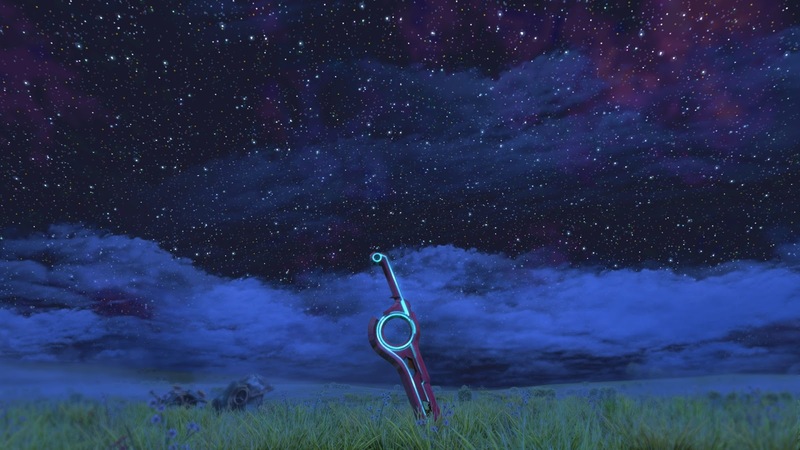 This series of posts will be a spoiler free reflection on each game and my take on its philosophical themes. I'd only recommend reading this if you have an open mind when discussing philosophy and religion, and the same goes if you plan to play and fully enjoy these games. 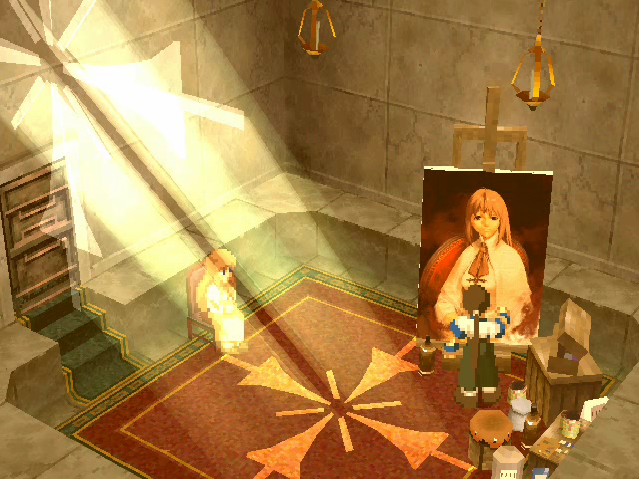 Religion and the idea of God have been stained by so much blood and pain throughout our history, it can be hard to look underneath it all and see the reality of our journey with the concept, which is why I truly love games like this. 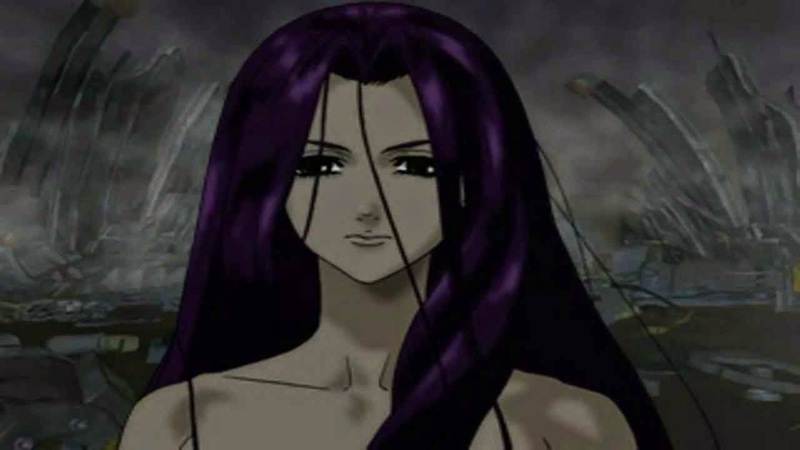 They encourage you to think objectively, and attempt to understand anew through the eyes of fictional characters. As a young man living in the bible belt, I grew up with a thirst for answers the religions surrounding me could never provide. I bought this game shortly after I began my career in computer technology. As, I played, the story seemed to weave together the broken threads dangling in my heart and mind of the nature of man, machines and God. 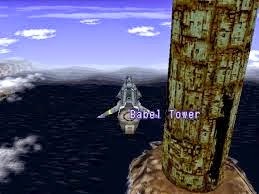 Though it contains one of the most intricate creation myths ever fabricated, at its heart, Xenogears is a love story. At first glance, a love story of just two people, but more deeply, a story of how creating connections through love can create meaning in a world where finding meaning seems impossible; a world where we must shatter the reality of everything we once believed in order to truly see the world as it really is. 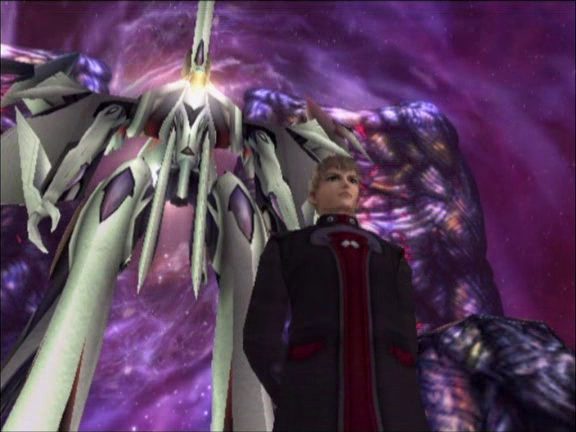 The overall theme of the game and especially the songs, Star of Tears and Small Two of Pieces, from the game's soundtrack, seem to echo inspiration from mankind's own journey with the concept of God. 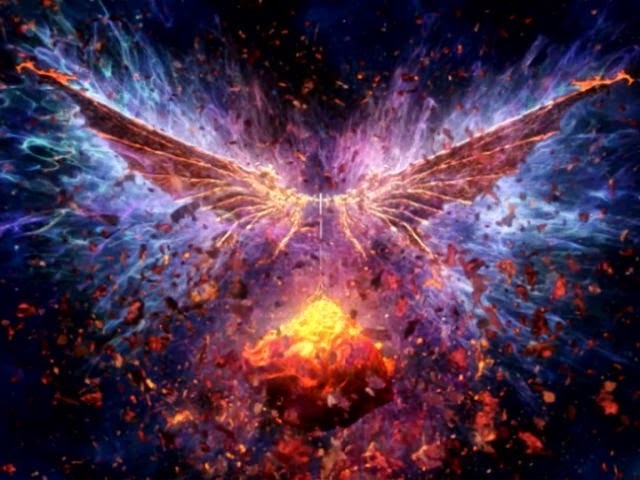 The characters eventually learn the true nature of the God of their world, and must come to terms with that reality in order to save the lives and the planet of those they love. As for our own journey as I see it so far, we met God in the mist of morning, in our infancy as a species, creating a reflection of our own image to place our hopes and dreams in. As we discovered the darkest waters of space and our unfathomable loneliness in its deep, unending night, we began to part ways. 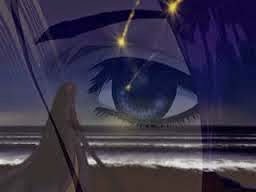 God was silent as we looked down at the world, peaceful and still from afar. We realized that even if we believed God could possibly meet us halfway, he was still farther away than we could ever imagine. Many of us are not sure where our journey with God can go from here, though our hearts still long to find God and to find meaning in our existence. At the edge of this dark water, we are left with the broken sword of spirit, the shattered shield of faith and tears of God that never fell, but will always run through our own hearts, for better or worse. As we grow and change, as does our reflection. A broken mirror is considered a horrible omen, but it’s the most honest reflection of ourselves, our universe, but most especially, our God we will ever see. God has never really died. He has only been shattered. We just pick up the pieces and create the reflection anew, as has been done throughout the history of civilization. That reflection may echo who we are at this moment in time, but no matter how hard some try to solidify this reflection, cracks will appear and eventually, new generations will once again try to repair their own shattered souls with the pieces left behind by our ancestors. Thank you for reading and I hope you look forward to the rest of this series! 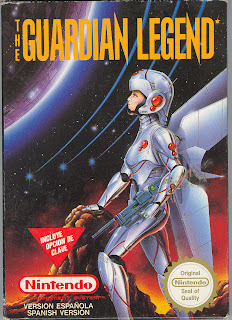 The Guardian Legend - Best NES game ever? 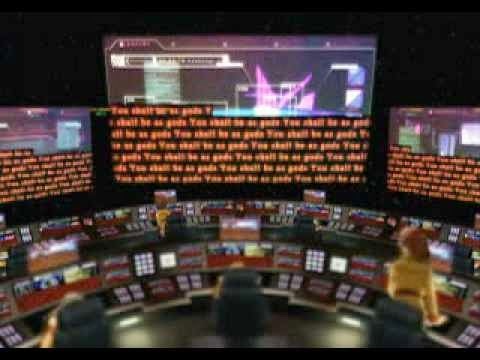 There's also an amazing guitar cover of this theme on the youtube. The Guardian Legend was released close to the end of the life of the NES, but it also must have had absolutely no advertising. I never heard about it, and even now, not many enthusiasts are aware of it. Well I'm here to make you aware of it. If you are a fan of Metroid , The Legend of Zelda , and top-down shoot'em ups (like Galaga ) I think you'll really enjoy it, as it combines gameplay of them all into one amazing package. 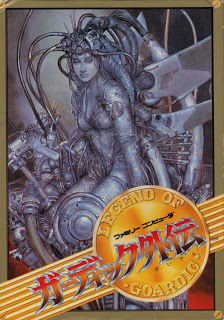 Considering the average price for it is $4 at the most, there's really no reason not to own this game if you still have an NES. 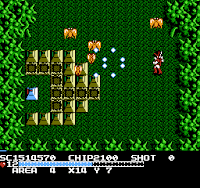 In the game, you play as The Guardian: a female cyborg soldier who can transform into a spaceship. She sets out to destroy a space station/planet full of evil alien lifeforms that is hurtling toward Earth. How could a premise like that not be full of win? 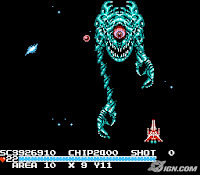 Like Metroid and Zelda, there's alot of exploration requiring weapon and item upgrades to access new areas. 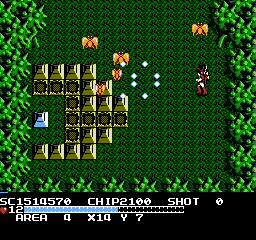 Each area has a unique feel and theme, as well, such as a forest area and ice cave area. If the title screen theme is any indication, this is all accompanied by one of the best soundtracks I've ever heard in an NES game. 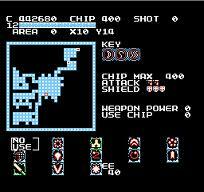 While most NES games like this were pretty unforgiving at making you figure out where to go, the map had a bit of a hint system highlighting where you needed to go next. 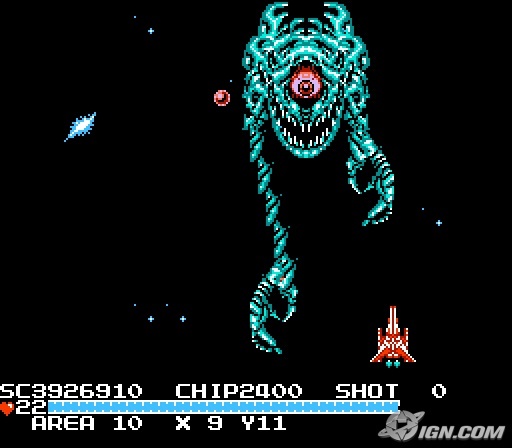 Kinda like Super Metroid 's map. 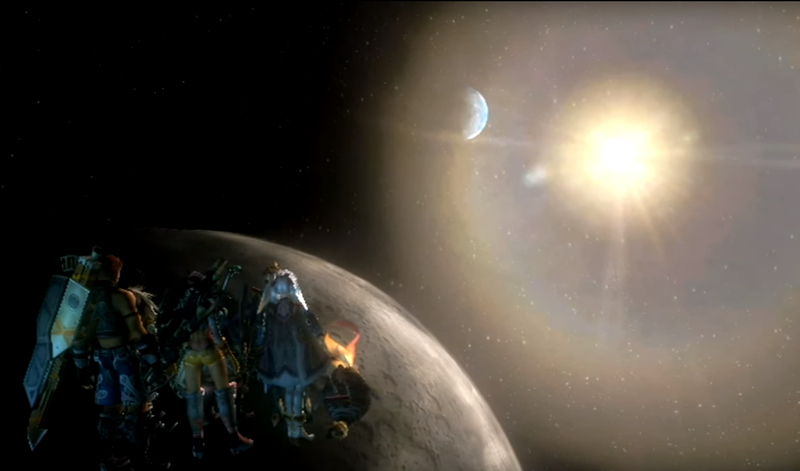 Now that perfectly captures the premise and feeling of the game. I think if more folks saw that on the store shelves, the game may have sold better. What can I say? It's Japan. They know exactly what to do when you say "female cyborg." At first, I can't help but think this is the kind of game that really deserves a sequel or remake, but after seeing what 20 years of being bled dry has done to some of my favorite game franchies, maybe it's better to just enjoy the shiny gem we've discovered rather than try to reinvent it and turn it into something really horrible . One of the best things about retro collecting can be discovering amazing games you never played and sometimes never even heard of. It can transport you to an age when ideas were new and fresh and everything you loved hadn't been rehashed to hell and back. Also, it can make you forget how old and bitter you've become. 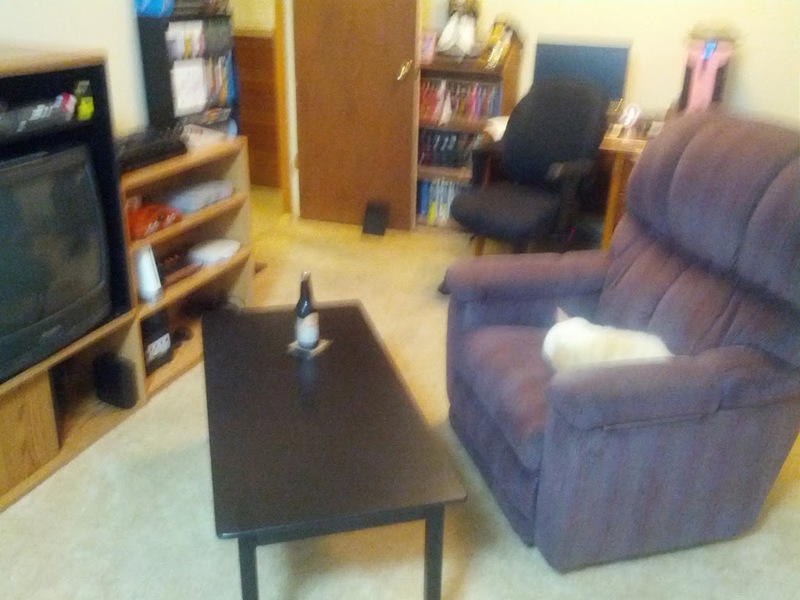 The entertainment center was a score from a local yard sale site for $45. 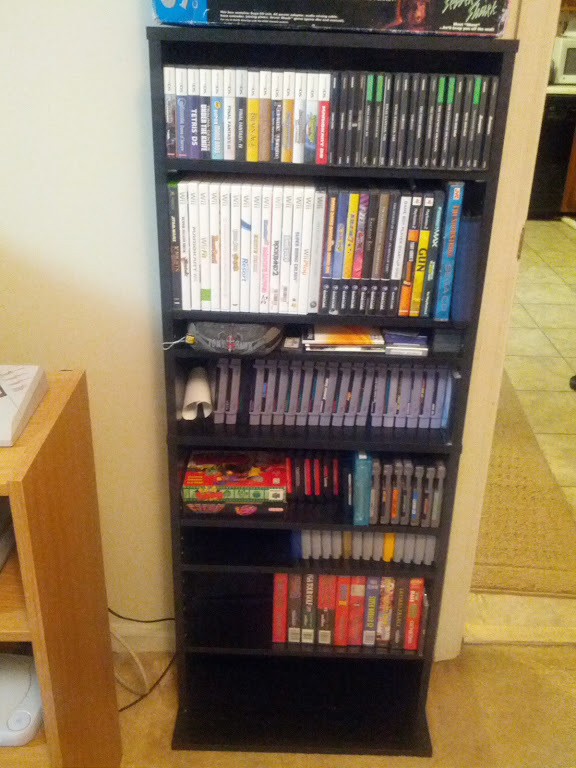 Obviously wasn't big enough to hold everything I wanted hooked up, so I repurposed one of my bookshelves. 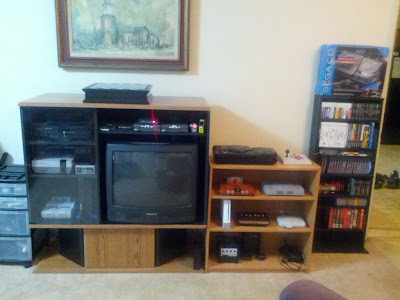 The retro setup is in the middle of the computer room. We both have our computer desks against each wall. At a later point when my desk is cleaner, I may post some of the interesting stuff there. 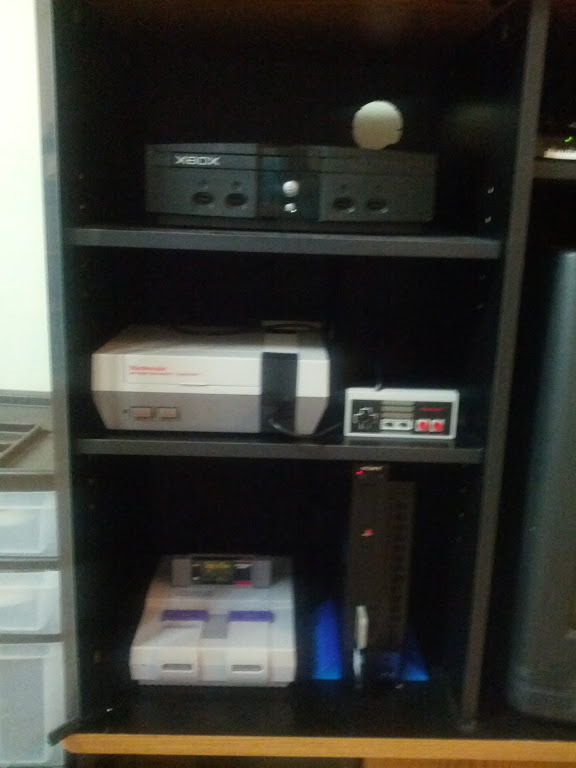 There's not really any preference in the order of the consoles on this shelf, though it has the glass door offers a bit of protection from dust and UV. It's basically whatever fit best or I acquired first. The Xbox is one I bought from a friend shortly after it was released. The SNES is a goodwill score, though I had to track down all it's cables. The Playstation 2 I bought on release. The auxillary shelf is just a cheap Walmart bookshelf with some holes punched in the back. Works out well, though I'd ideally like to have a protective cabinet for these too, someday. You may recognize the Black Beast from my previous post: The Sega Genesis Model 1 / Sega CD combo. I actually wanted to put this on the other shelf and swap it with the XBOX, but it was too massive to fit in it. Next to it is an NES Advantage joystick. I've got to admit, this thing is one of the most sturdy accessories I've ever held for any game system. It plays really well with arcade style games, but it's a bit hard for me to use for games I'm used to playing with the game pad. Got this from the local game store. N64 and Playstation are goodwill finds. Both were not working at all and extremely dirty, but after taking them apart and cleaning, they both work great now. The Wii I originally bought on release. It's not really retro, aside from some of the virtual console games, but it will probably remain as the newest console in the room. The Atari Flashback 2 is a goodwill find, though it's basically in brand new condition. I am debating getting rid of it since I'm not that big a fan of the Atari 2600. The PS One I found in storage at my parents' place. I completely forgot I ever owned one until I found it. I'll probably get rid of the other Playstation. The Gamecube was also a goodwill find, since my brother sold my original Gamecube after letting him borrow it. Luckilly, they are extremely cheap. Unfortunately some of the games I'd like to get for it are pretty pricy. I do still have The Legend of Zelda: The Wind Waker for it, though, which is one of my favorite Zelda games. 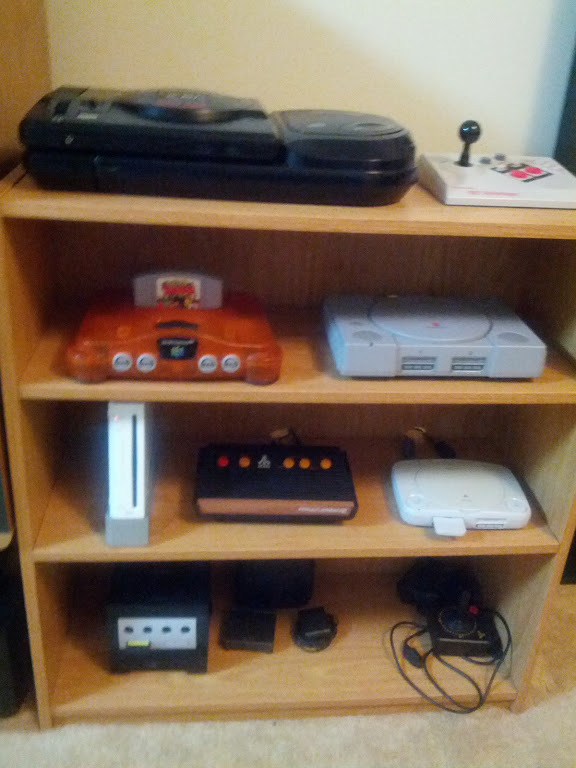 There's not much room left, but honestly there's not much left I'd like to get as far as consoles. Maybe a Sega Saturn System and Sega Dreamcast , but definitely no rush on those. The main focus on my collecting is stuff that I played at some point in my past. It's honestly a nightmare of wires behind there now, but it works. I have three of these video switch box daisy chained together. 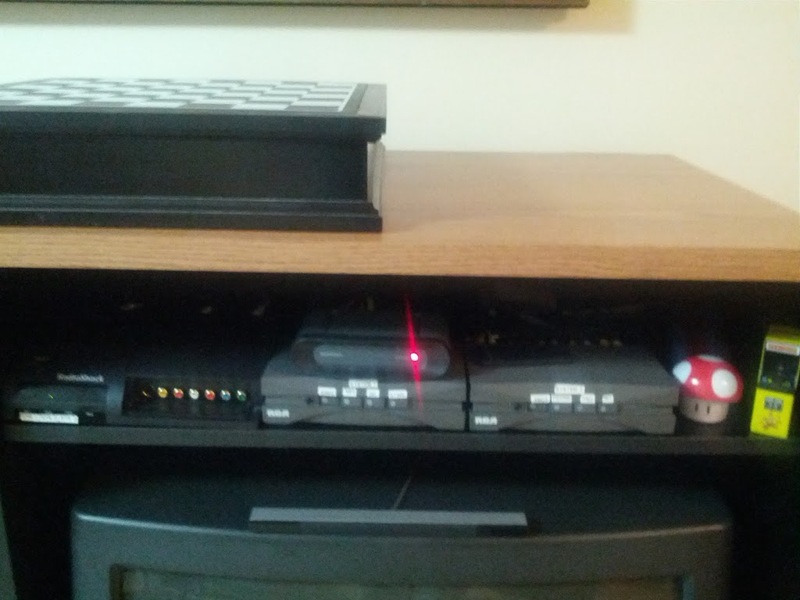 Most of the consoles connect with composite RCA jacks, and the TV only has a RF input, so an RF Modulator has to be used. It's easy enough: the lady of the house can just press the button of whatever console she wants to play when she's alone, so I consider it a successful setup. 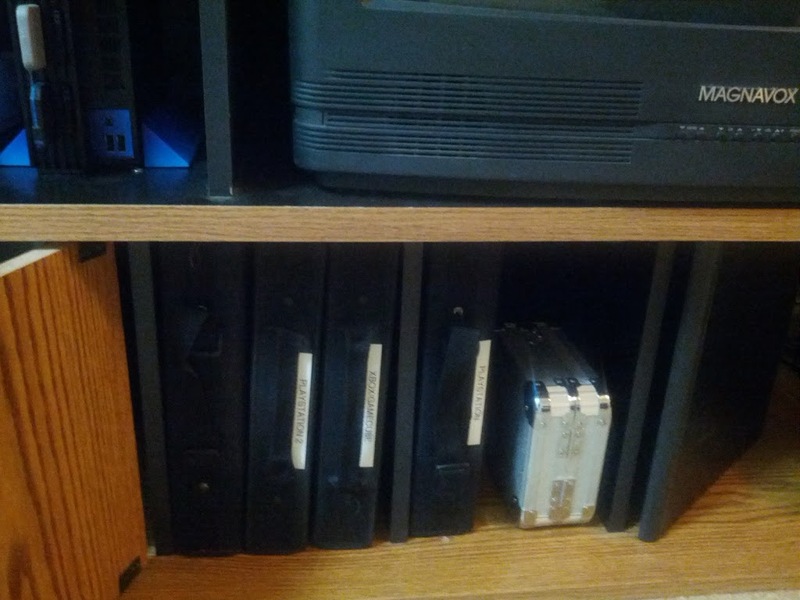 I keep some CD binders of XBOX, Playstation, and Playstation 2 games in the storage beneath the entertainment center. 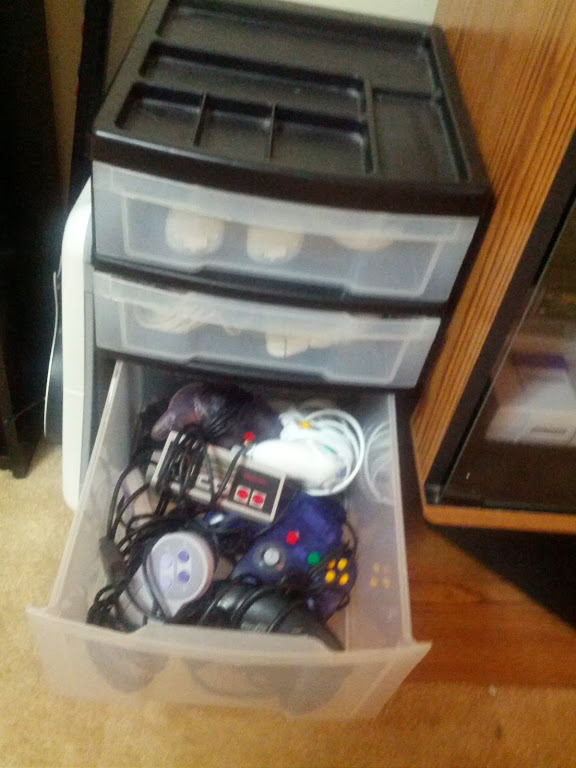 Controllers and accessories are in this storage bin, though it's starting to get pretty full. Most of the controllers' cords are long enough for our use, but for some reason the Genesis controller is like 2 feet long. I don't remember them being that short, but I definitely need to either get an extension or find controllers with longer cables. Here's the most of the collection of games I have so far. I have a bit of room left, but I'll probably grab another shelf like this eventually if the collection grows beyond this shelf. N64 has by far the most annoying game cartridges ever, by the way. There's no end labels on them at all, so it's pretty annoying going through all the carts trying to find the one you are looking for. Some of the carts do have cool colors to identify them, such as The Legend of Zelda: Ocarina of Time , Donkey Kong 64 , and Tony Hawk's Pro Skater . 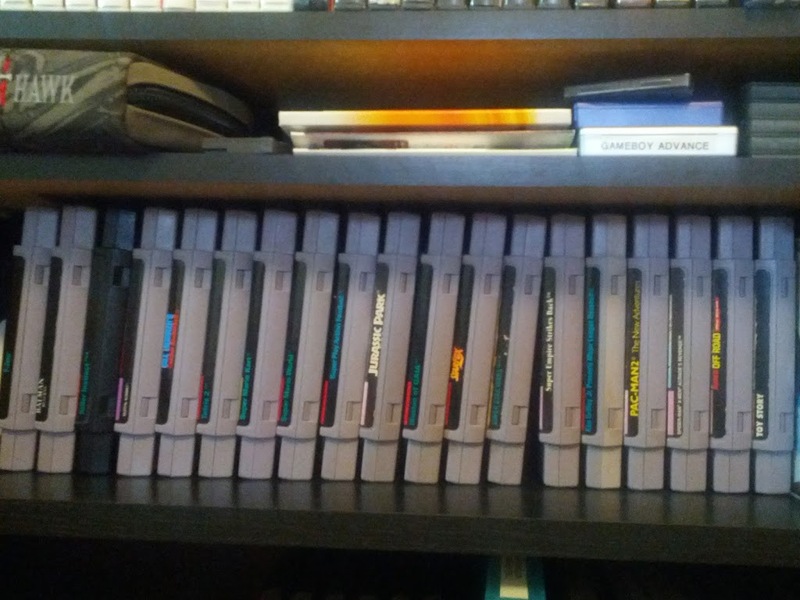 I'm still looking for a solution to organizing these games though. Most of the cart collection I've built off of the local game shop or goodwill finds though I had a friend give me one of my favorite SNES games ever: Secret of Mana . I was pretty blown away. Be sure to check with your friends and family if you ever get into collecting stuff like this. You never know what they have tucked away. Well that's a general overview of my retro room! Hope you enjoyed checking it out!